"You are she who is not, I am he who is." 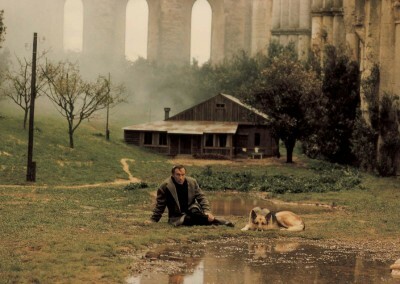 If ever a film embodied a state of mind, it would be Andrei Tarkovsky's 1983 release, Nostalghia. The term "nostalgia" refers to a longing for a past time, to a reverie of memory, often with fondness and a little bit of regret. One looks back with the hope of regaining what has gone, as opposed to putting those things to bed. 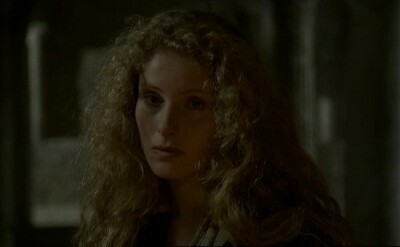 Made while the Russian director was living in exile in Italy, Nostalghia is a lengthy rumination on banishment and disconnection. Written in collaboration with Tonino Guerra (L'Avventura), it's Tarkovsky's ode to a country he missed, filtered through examinations of art and religion. Lovers of beauty and true believers find themselves at odds with a cold, cruel world governed by mediocrity. Oleg Yankovsky, who was also in Tarkovsky's The Mirror, stars as Andrei, a stand-in for the director in both name and appearance. Andrei is a poet touring Italy to explore the sites visited in the late 18th Century by an obscure Russian composer who had also been cast out from his homeland. His music from the period, as well as his letters (read in voiceover), expressed a desire to return to his origins. While this appears to essentially be a business trip for Andrei, research for his next book, it's a ruse that quickly unravels. Something else is going on with the poet. He is melancholy, stubborn, and downright rude to his guide, the beautiful Eugenia (Domiziana Giordano). As Nostalghia begins, she has taken him to a remote church devoted to the Madonna (or "the Mother"), and despite the pit stop being his idea, he refuses to go in. He has come to the doorstep of that which he seeks, but he cannot make himself cross the threshold. Surely the metaphor is obvious. The benevolence of Andrei's mother country is now out of his reach, if indeed he even believes in it at anymore. Andrei appears to be a man without faith. He scoffs at translated poetry, saying art cannot be removed from its original language or context. He is an individual adrift and is presumably at least partially responsible for his own fate. Memories of a life back home, shot in mournful black-and-white, show a wife and children he has left behind. When Eugenia suggests the husband call home, he avoids it. The growing sexual tension between them only adds to the perception of sin and wrongdoing. While at a spa, Andrei and Eugenia meet another man without a home, the nomadic Domenico (Erland Josephson, a regular of Ingmar Bergman's films and also the lead in Tarkovsky's final effort, The Sacrifice). Domenico's history is tragic and misguided. He locked his family in their house for seven years, believing the apocalypse was upon them. Authorities eventually intervened; Domenico's loved ones were taken from him, and he was cut loose to live a public shame. The two men, on some levels, share the same malady, and are intended as doubles. At various points, their flashbacks even begin to crossover. Is not the dog that travels with Domenico the same dog that we see on Andrei's farm in Russia? 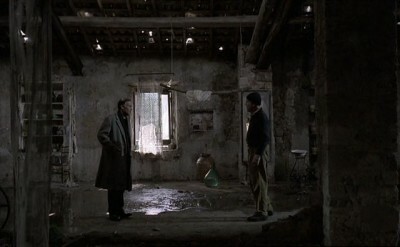 Indeed, the dog who watches Domenico literally destroy himself in Nostalghia's most harrowing scene, and the dog that is there at the end, in the film's final shot, the haunting pullback from Andrei and the still animal at rest in a bizarre homage to Andrew Wyeth's painting Christina's World. In this vision, Andrei is not the girl longing for a home just out of sight, but a man who has turned his back on an idyllic past and is now just a tiny speck in a larger history. If you consider what I've already written, you'll note that I cover more of what Nostalghia is about than what happens. Or, to put a finer point on it, what has happened and what that means to the present of the motion picture. To detail the things that actually occur in the movie seems rather pointless. 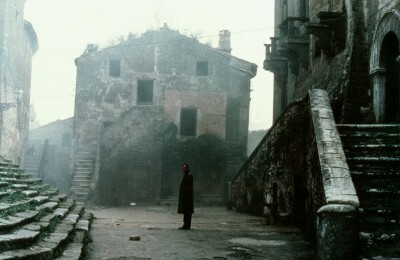 Nostalghia does not contain a traditional narrative. Actions do cause reactions, but the characters exist more in an idea space than they do in a conventional representation of a knowable world. This is a movie, after all, that climaxes with a man trying to carry a candle back and forth across a reservoir without the flame going out. What Andrei and Domenico do is puzzling, and the way their environment and fellow travelers react to their endeavors seems logical in context, but these things are just as strange and out-of-joint when taken separately from the core. As with all of his films, Tarkovsky is applying a very specific aesthetic, borne of his own unique perception of time and space. Nostalghia moves slowly, a cinematic syrup rolling over the plates of a film projector like blood pooling under a cracked skull. Its languid pacing requires focus and patience, and rewards the viewer that can provide them. Nostalgia is demanding, but it's never boring, partially because it's never about being bored and also partially because it is beautiful to look at. The director and his d.p. Giuseppe Lanci (Johnny Stecchino, Traveling Companion) transform the drab grays and browns of the rundown Italian landscapes into something haunting and lovely. The camera moves amidst the ruins like a sleepy tourist, deliberate in its observations, yet open to the possibilities. In other words, exactly as its main subjects themselves should be, but in a lot of ways, what these two closed-off men are not. Kino's Blu-ray of Nostalghia boasts a new high-definition transfer mastered in 1080p at a 1.66:1 aspect ratio. The print was made from "archival 35mm film elements," and I am sure will cause some debates. Colors are vivid, and resolution is crisp, with an impressive level of detail. One can peer deep into the scenes, looking as far back as the stony corridors and foggy landscapes will allow. There is, however, consistent surface noise on the image. Lots of cracks and pops that become less evident as the film wears on, though it's hard to tell if that's just because the source material simply gets better or if, as a viewer, my eyes adjusted. Personally, this kind of thing doesn't bother me, particularly as the transfer does allow for the incredible beauty that Tarkovsky was striving for. Look particularly at the scenes where Andrei is underground in the flooded ruin. There is that lingering shot of the rippling water, the bubbles, and the trash, with the light from above reflecting on the surface--it's breathtaking in HD. The Italian soundtrack has been remixed for 2.0 and sounds really good. There are no tonal issues, no distortion, and dialogue is complete and easy to discern. Ambient noise is nicely placed in the mix, allowing for an immersive viewing experience despite not having a more complex audio track. Highly Recommended. Andrei Tarkovksy's Nostalghia is a personal work from an artist struggling with his own failures and banishment from the country where he was born. Shot in Italy, the Russian director's rumination on home and regret follows two men with separate yet compatible mental afflictions. They are both deluded in their own ways, appropriately crazy in a world out of balance, seeking answers for what they have lost and reconciling their own responsibility for their conditions. Nostalghia is deliberately paced, demanding its audience's attention, yet providing much to pay attention to.